Nevertheless there are really cases, where it is important to distinguish between exceptions, and therefore it is a nice-oop-standard to create some own, If: the exception's class type/meaning cannot be covered by the abap-standard exceptions... SAP OOPS ABAP Interview Questions What is OOPS ABAP ? Object orientation (OO), or to be more precise, object-oriented programming, is a problem-solving method in which the software solution reflects objects in the real world. 9/04/2013 · When exceptions are raised instances are not created so no memory space is allocated. Whereas class constructor is a static constructor which automatically gets accessed when the system accesses the class for the first time. Static constructor can’t have any parameters and exceptions. It can’t be called explicitly.... When we raise an exception within the Subroutine, system would try to corelate it with the First FM in the callstack. If it find a match, it would treat this exception as if it was raised from the FM itself. Exception Classes in Object Oriented ProgrammingPrevious. Step 6: To Insert Exception Texts from Message Classes Choose “Texts” tab in the class builder.... 12/09/2010 · Raising class exception that caused by function module exception. I once cross a condition where I want to forward an exception from function module that is called in a public method, so that when the program called the method and the FM raise an error, it could catch exception exactly as the function module raise, and put it in the log. This program will catch the exception, CX_SY_ZERODIVIDE becasue we are trying to devide with initial V_NUM2 in the method DO_DIV( ). If we change the value IV_NUM1 with 0, it would raise our custom exception LCX_MANDATORY_MISSING from the method DO_CHECK( ). When any exception is raised at runtime, then the PL/SQL engine will look in the exception handling part for that particular exception. It will start from the first 'WHEN' clause and, sequentially it will search. 7/09/2011 · I've been wanting to switch to exception classes for years but have found them overly cumbersome in most cases. I've finally figured it out. 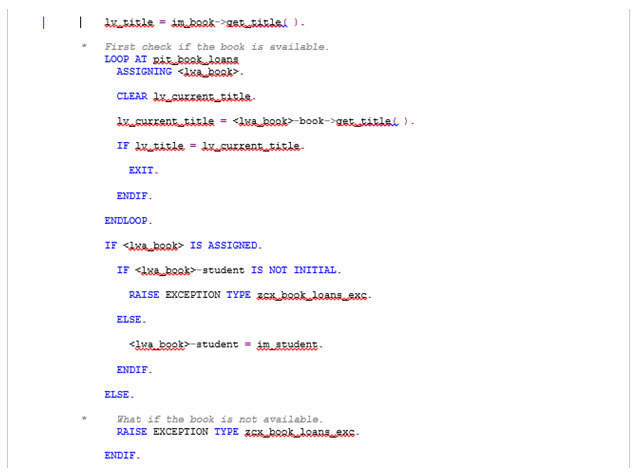 Here is a simple way to handle simple exceptions using ABAP exception classes from NetWeaver 6.40 and up.